Venus is the planet of love, art and beauty. Wherever it is in the zodiac, there you will find information on where love is in your life, how good you will be looking in order to attract love, and what beautiful things you should surround yourself with in order to maximize the staying power of love and beauty. 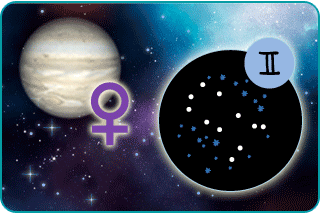 Venus moved into Gemini on July 5 and will be there until July 31. Gemini is the zodiac sign of communication, of bringing two sides together. The Twin is the ultimate empathic, existing outside one’s self, an individual and yet a pair. Venus expresses herself quite freely in this sign after having visited pragmatic Taurus. Look to let a little more hang out and to speak more openly than might be ordinary for you. Venus in Gemini is nothing if she is not candid, but there is always some finessing to your comments at this time. Instead of being blunt, Venus in Gemini is direct in a pretty package. Read your sign below to see how your looks and appeal will assist in your search for love between now and July 31. If you know your rising sign, check that forecast as well. The Pros: Venus in Gemini allows you a certain charisma to begin talking to whomever you wish. If you are looking for love, or just flirting at work to get your desk moved to a better location, people are listening to what you have to say and liking what they hear. The Cons: If you have been getting by on your looks for a little too long, you will find that verbal communication that is working so strong for your sign to be a little tougher to start up. Best Colors: Light tans, creamy beiges. The Pros: Your ruling planet, Venus, enters a sympathetic sign, so look for advancement simply by getting near like-minded people, especially authority figures. You might not be reeling in a soul mate, but you could be attracting career advancement. The Cons: You will find the attention a chance to get closer to your favorite type of people: rich ones. You might be bypassing people who can assist your career in the fleeting chase of fiscal glamour. Best Colors: The darker the purple, the better. The Pros: With Venus in your sign, get on the prowl for the soul mate of your dreams. This is as good a few weeks to attract your ideal partner as exists in the heavens. The more you can be yourself among the candidates for your hand, the higher quality pick you will have. The Cons: There are few negatives to this planetary position, save for attracting the unwanted attention of losers you might have once dated. Feel free to drop a hint and make them scatter. Best Colors: If you are going to wear red at all this year, this is the time. The Pros: You will have a knack to know what a possible soul mate wants. If you can morph just a bit into appearing to be the pot of gold at the end of this person’s rainbow, you will be looking at a quick romance headed toward a committed relationship. And you will have a better sense of what co-workers and friends want as well. The Cons: Your empathy could make people assume you are someone who you are really just not. This might create problems later in the year, when you will be more forthright, if even by accident, about how you feel. Best Colors: Marine greens and synthetic blues. The Pros: Your ordinarily high charisma will be off the charts and looking as good as you ever have will boost your popularity. Take advantage of this and mingle at as many parties and summer barbecues as possible. In someone’s backyard there awaits a deep soul mate encounter. The Cons: Being the life of the party may mean you get so wrapped up in telling your stories and flitting from person to person that you may miss out on meeting Mister Right. Keep your schedule flexible and bring a friend who can extract you from time-wasters. Best Colors: Something silver will accent you in the summer spotlight. The Pros: Venus in Gemini will bring moments of great attention and any attention to the details of your appearance will bring rewards in a career boost. As far as love goes, you will be more inclined to play matchmaker for a friend than to find that one perfect catch for yourself between now and July 31. The Cons: You stick out at work and in any job interviews, but this might end up bringing a little more scrutiny than you are used to. Brush up on company policy and your improvisational skills. Best Colors: If you can match dark earth tones with some greens, you will get noticed in a good way. The Pros: This is a great time to be a Libra. Your current love relationship is strengthened as you two find commonalities amidst your differences. This is a great time to re-exchange vows if you have been in a committed relationship more than ten years. Single Libras at the start of July will not be at the end of the month. Look for opposites to attract. The Cons: Sticking around familiar ground might limit your chances for an inspiring summer. Get out and see the world, or at least try a new restaurant to go with that new dating material. Committed Libras should try a new socializing spot as well. Best Colors: A muted pink will be a magnet for stares from across the room. The Pros: Venus in Gemini is great for the Scorpion. You can pursue passion with a seduction style that borders on sheer expertise. Dropping even the subtlest hints will ensure that others pick up the check for you. You will be attracting people with an appreciation of life’s material comforts and you are in an excellent position to talk them into sharing with you. The Cons: Old enemies may reappear in mid-July and they will not be forgiving. Those you thought out of your way will suddenly be vying for the prize that you most seek. If you have been getting by on your appearance, you will find someone with a mastery of the language outpacing you for a special someone. Best Colors: Black of course. The Pros: You will be seen as loyal and committed and may reap a few rewards that are ordinarily denied someone as independent as you. Take this newfound love of the establishment with a grain of salt as you will not be in the good graces of the old order forever. Find a way to have fun or profit and, most of all, enjoy yourself. The Cons: Partnership issues will surface and intensify throughout July. Venus in Gemini directly confronts your relationship with a long-term partner. Aim to be genuine in your communication and you risk not upsetting the whole relationship. Keep the agenda focused on the present and do not revisit the past. Best Colors: Gray and blue will do. The Pros: Your work ethic will get noticed, talked about and perhaps even celebrated. You should do quite well with the people who are around you at school or on the job. A possible hint at a passionate exchange with a co-worker becomes more than just a flight of fancy. The flirtations could make for more trips to cool down at the water cooler before July 31. The Cons: You are not going to finish every task or assignment on time and you are finding a new love of getting things done clashes with your old way of doing things. Let the powers that be know they are getting the best of you and work to find a new routine. Best Colors: Gold and bright yellow, with rust highlights for contrast. The Pros: An intense romance could spring up and dominate your life after only one casual conversation. This romance blossoming might be a good thing to relieve the summer doldrums. If you enjoy the company of children, July will give you many opportunities to lead the pack into new discoveries. The Cons: Try to make sure that your new lover knows the limits of what you are able to give and commit to. There are some people who fall head over heels in love while you never really get your heels far from the ground, nor your head anywhere near it. Venus in Gemini demands that you develop some empathy. Best Colors: Orange and a touch of a dark contrasting color will highlight you like never before. The Pros: Your way of absorbing the emphasis on communication that Venus lets out when it visits Gemini is in making your home the most inviting place possible. Summer is always nice for entertaining; so if you cannot take advantage of the verbal muse inherent in the Venus visit to Gemini, let a nice party in an inviting space do the talking for you. The Cons: So many friends will be falling in love while you might feel left out of the mating ritual. The passion you see will one day find you, so play hostess of hospitality and see what it gets you. Word will get out of what a nice place you have, and perhaps Mr. Right will soon want to visit. Best Colors: Turquoise and Umber combine to attract interest.